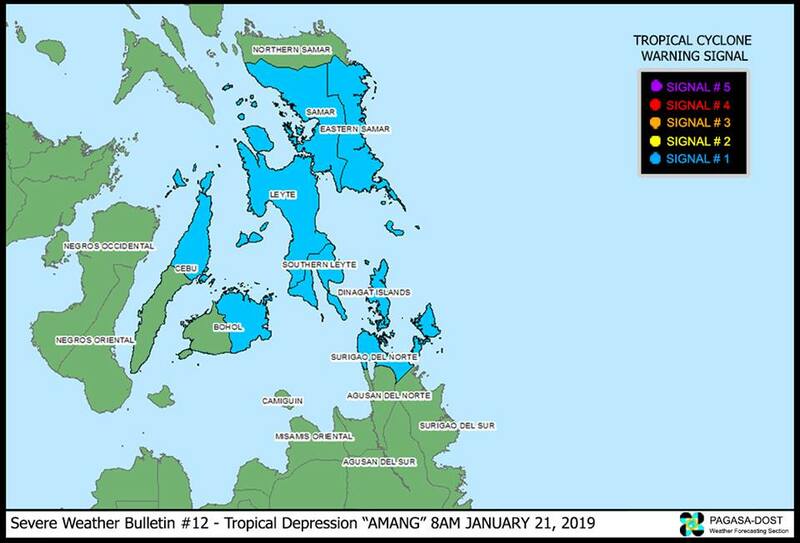 MANILA, Philippines - Tropical Depression 'Amang', the first tropical cyclone of 2019, has changed its course and now heading towards Leyte-Samar area, state weather bureau PAGASA announced in its 8:00 am update on Monday, January 21. 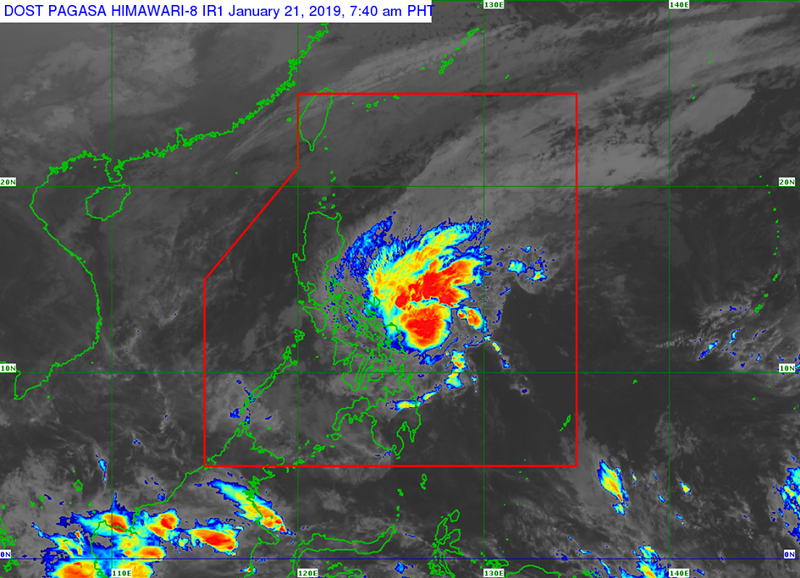 Latest satellite image of Tropical Depression 'Amang' courtesy of DOST-PAGASA. 'Bagyong Amang' has made landfall over Siargao Island, Surigao del Norte at 8:00 pm on Sunday. At 7:00 am today, the center of 'Bagyong Amang' was estimated based on all available data at in the vicinity of Guiuan, Eastern Samar. TD Amang has maximum sustained winds of 45 km/h near the center and gustiness of up to 60 km/h. It is forecast to move Northwest at 10 km/h or at 75 km West of Tacloban City, Leyte Tuesday morning. 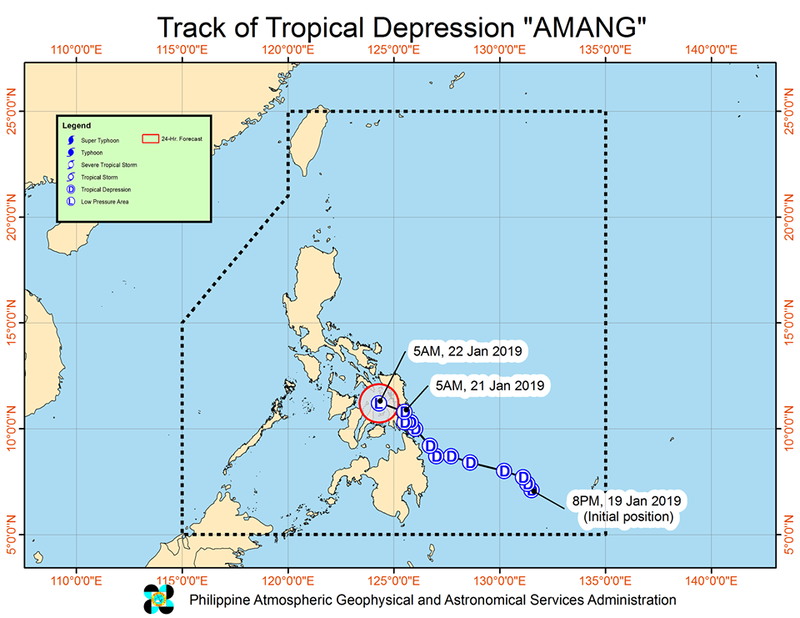 Track of Tropical Depression 'Amang' courtesy of DOST-PAGASA. Eight (8) areas under Signal No. 1 as 'Amang' changed its course. Today, moderate to heavy rains may prevail over Eastern Visayas, Central Visayas, and Bicol Region. Meanwhile, tomorrow (January 22), moderate to heavy rains may be experienced over Eastern Visayas, Catanduanes, Albay, Sorsogon and Masbate. Fisherfolks and those with small seacrafts are advised not to venture out over the seaboards of areas under TCWS #1, the northern and western seaboards of Northern Luzon, and the eastern seaboards of Luzon, Visayas and Mindanao due to the approaching Tropical Depression and the surge of Northeast Monsoon.